Globalcom has join network in giving Bonus to their customers that has been inactive for a while , a way to welcome them back with enticing bonus. Glo is giving out 600 Naira bonus when you recharge 100 Naira , and 6000 Naira when you recharge with 1000 Naira , this is a sure way to get back their customers . 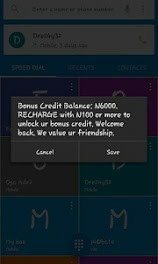 Note: The Glo bonus can't be used to subscribe but can be used to make calls and browse as for the 6000 Naira bonus , 4000 Naira is for calls while 2000 Naira is for browsing , so keep recharging for more . How To Activate This Bonus. 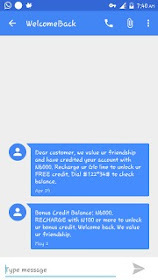 Simply just look for you Global sim that you haven't used for a month or more and insert it into your phone and wait for a message like this . After getting that message you can recharge and get your instant bonus .